Kids wellies are on my mind! With the summer sun seeming like a distant memory, it’s time to get the kids all prepared for the wet and wild winter months. It’s a wonder these haven’t been around for years, but now they are, we sure are glad to see them! No longer will your little ones struggle to slip on their wellies: the looped handles are perfect for little hands and the wellies come in a choice of patterns including butterflies and tractors. They have cushioned soles and cotton lining to prevent rubbing on your child’s calves and feet too. The super-strong integrated handles make them easy to put on, even with thick gloves. These kids’ wellies can be found at Muddy Puddles. Kids’ themed clothes always go down a storm at home. A practical play on fancy dress, these awesome dinosaur wellies are sure to have your little boy roaring and stomping all the way to school, the park and thoroughly enjoying the family outing. You may struggle to get him to take them off once indoors though, as we’re sure he’ll love them come rain or shine. 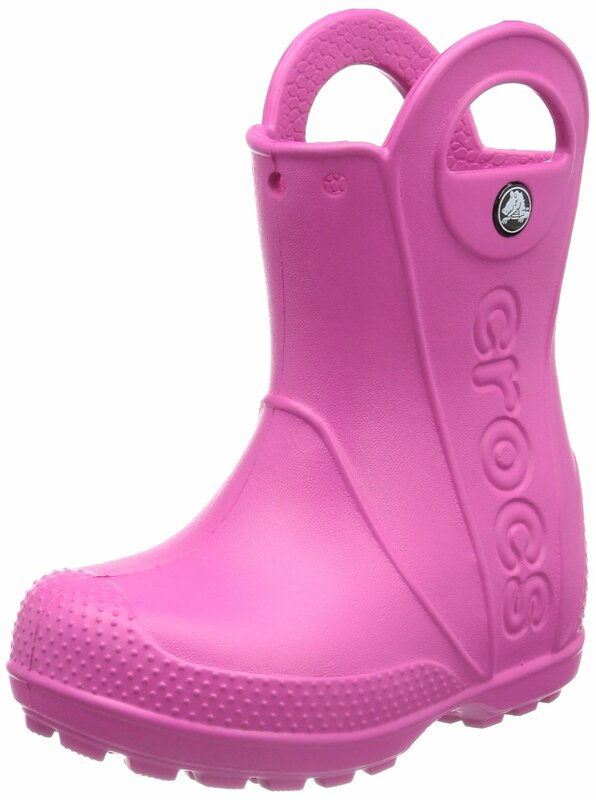 Priding themselves on offering the lightest kids footwear, Crocs Jaunt wellies are rather bulbous but do come in bright colours to capture kiddies’ attention. They have mini finger holes for helping to get them on and they even have smaller holes for adding Jibbitz to personalise their shoes! They have been designed to keep even the smallest of toes toasty warm, and the croslite boots will mould to the shape of their feet too. Nothing lets your kids’ imaginations go wild like a pair of ‘paint your own’ wellies. Available in a number of colours, all boots come with non-toxic waterproof pens in six colours so your mini-Matisse can design their own pattern – or even write their name! These creative wellies can be found at Find Me A Gift.